Hurt and defiance flared in Penny. She had worked hard for this degree. Now she had the A’s and the recommendation to prove it. How could her father doubt her intentions? For attractive, vivacious Penny Scott it was a bad beginning to her career, but she didn’t have long to worry about it. Only a few days later came the call that was to put her dedication to the test. She was confronted with a strong-willed and wealthy patient whose handsome son was determined to cause trouble…a lonely summer home in the Ozarks were strange, frightening things happened without warning…and a bearded fanatic who would go to any length to “protect” the mountain folk from meddling intruders. Penny Scott found herself fighting fiercely for her own survival as well as her patient’s. 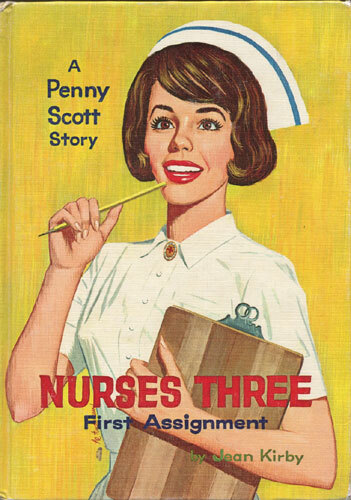 With nothing but her own knowledge and judgment to rely on, she thought often of her father’s words…”Keep your head, Penny!” For a nurse, she knew, a first assignment like this one could be the most decisive step in her life.